For the trekkers having fervor of exploring the remote Himalayan Region, Lamayuru Trekking Tour via Kanji La is a perfect trip to plan. It is a challenging trail but the tranquility and exquisiteness of the route make the challenge worth accepting. This classic trek calls trekkers to transverse through most of the Heartland of Zanskar and wraps some mesmerizing landscapes. 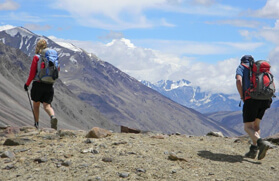 This trail incorporates visiting scores of old and spectacular monasteries of Ladakh and Zanskar regions. 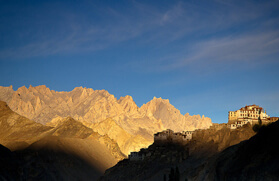 Accompany your travel manager in early morning to catch the flight for Leh. You will be received by your travel manager from airport, from where you will be escorted to your pre-booked hotel. Take a full day rest in order to acclimatize yourself. 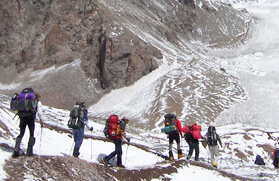 In evening, attend the formal meeting with your trekking manager along with the other crewmembers. Enjoy the lunch, dinner and overnight stay at the hotel. Enjoy the breakfast at hotel, after which you will be taken to the base camp of trekking by your trekking manager. You will drive to Lamayuru, on the route of which you will visit Lamayuru Monastery. Your trekking excursion will start from Lamayuru. In order to stay overnight, you may go for tents or hotels according to your wish. You will excurse through moderately easy trails on your first day of trekking. You will be strolling on a steady trail to Prinkti La (3729 mts). However, after Shilla Village, the trail suddenly becomes slender and arid. This stretch takes about 3 hours to cross and reach Wanla. You will stay overnight in a tent in Wanla. After savoring the scrumptious breakfast, you will embark on the trek to Hanupatta. It is a 5-hrs trekking. In the beginning, you will pass through a flat section. After this section, you will cross the right bank of Penji La. From here, you will go down the slope to reach Hanupatta. At Hanupatta, you will stay overnight at the camp. Enjoy the breakfast and then set on for the trekking excursion to Photoskar. 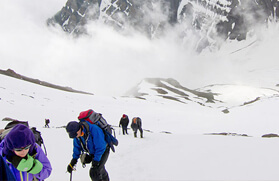 It is a 7-hour trekking route that passes through numerous rivers and stony valley and reaches Photoskar (3750 mts). Overnight stay at Photoskar. Today, you will trek to absorbing Lingshed via Sengge La. Take your lunch with you and start on with your crew. 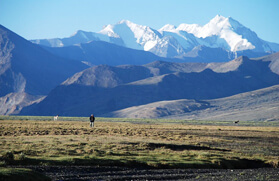 Firstly, you will ascend to Bumiktse La (4200 mts) from Photoskar. From here, you will relish an easy descent to adjoining verdant dale that leads to the foot of Sengge La. Enjoy your lunch here and take a rest for some time. Start for your next destination after having lunch and taking some rest. You next destination is Kiupa La (3850 mts). From this point, there is a steep descent to the rurals of Gongma. The Nierag Valley will leave you spellbind. You will reach to Lingshed after crossing Murgum Valley (4100 meters). Visit Lingshed Monastery here and enjoy the overnight stay in tent. This day is free for relaxation. Programs and schedule may change depending upon the situations. You may savor the nature's exquisiteness and capture it in camera. Night stay will be at the same point. Today you will have the special experience of venturing into the lush green valleys and beautiful passes. To reach from Lingshed ascent to the Hanuma La pass (4700mts). From there enjoy a gradual descent to Snertse. Overnight stay at camp. You will trek to Hanumil this morning. On crossing a crisscross concourse, you will at the side of river Oma Chu. From this bank, you will ascend to Parfi La (3900 meters). Enjoy your lunch at Parfi La and then descend to foot of the pass. Stroll through the pristine platue leading to Hanumil. This day excursion will be of 6 hours. Overnight stay at Hanumil. After having breakfast, start for Pishu. Passing the scenic plateau, you will have to cross the river bridge in order to reach Pishu. It is total 5 hours of trekking. Visit Pishu in late evening, witness the spectacular rural life, and enjoy the overnight stay here. Set on for you next halt Karsha at morning. On the route, you will cross Rinam. It takes 5 hours of trekking to reach Karsha. 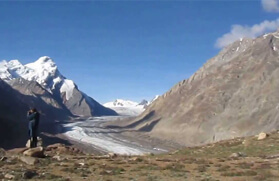 This trekking is carried out along the banks of Zanskar River. The grandeur of this ravine is second to none. Relish the night stay at Karsha. Start the journey early morning at 5'o' clock to Padum. En Route you will pass through Doda River. Stroll through the sandy terrain to arrive at Pipiting, where you will savor your lunch. Move forward to Padum from Pipiting. It takes around 3-4 hours of trekking to reach Padum. In evening, visit the local Gompas. Enjoy the bonfire and overnight stay at Padum. This morning, you will drive to Rangdum (3657 meters). Proceed to Rangdum after savoring hearty breakfast. 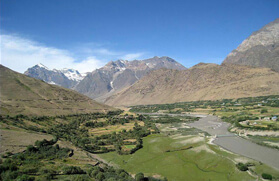 Rangdum is situated 130 kilometers southeast of Kargil district. This place is positioned in between Padum and Kargil. Endowed by the gripping ambiance, Rangdum is well known for arresting Buddhist Monastery built in 18th century. Overnight stay in the tent and Rangdum. Rangdum is counted among the most imposing valleys around the globe. This is a spare day to take rest in Rangdum. This absorbing place is wonderful for camping in the midst of Himalayan opulence. You should not miss to visit Rangdum Gompa after lunch. Overnight stay in Rangdum. Enjoy the scrumptious breakfast in camp. From this day, you will begin your trekking backwards. You will be taken to Kanji La (5150 meters) by your trekking guide. Trail through the Kanji Ravine for 7-8 hours. At the Y-junction of Puzdon La and Kanji La, establish your temporary camp and do overnight stay here. Have the breakfast and then start for 7-8 hours trekking to reach the next destination i.e. Kong River (4300 meters). Relish the slow and steady expedition. Have the night stay at camp. Enjoy the Leh Kanji breakfast. Kanji is positioned at 3850 meters. Ongoing descent to Kanji is certainly mesmerizing. It takes 4 hours in exploring complete area. On passing the fascinating gorge of Kanji, you will come across a secluded and idyllic beauty. Overnight stay at Kanji. Leave for Shilakong River (4100 meters) after having breakfast. Near the river, you will find the next campsite. 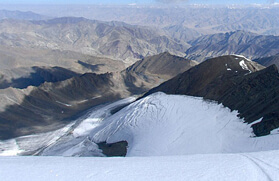 On the route, you will visit Yogma La (4700 meters). Have a dinner and take rest at campsite along with having overnight stay. This is your last day of trekking. Walk to Lamayuru crossing through Shilla Village on the route. From here, you will get the pickup for Uletokpo. Arrive at the luxury camp located at an altitude of 9000 feet. The off beaten tracks on the bank of river Indus are highly popular amongst the tourists. Get you pick for your next destination from here. Enjoy overnight stay at Uletokpo. Drive to Alchi in morning after having breakfast. 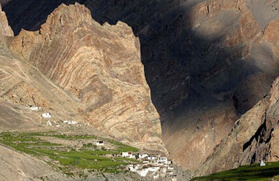 You will come across Gurudwara Pathar Sahib, the Magnetic Hill and Hall of Fame on the route. Have your lunch after reaching Alchi. Visit Alchi's temple to explore customary rural lifestyles of locales. You will be taken by surface to Leh from here. 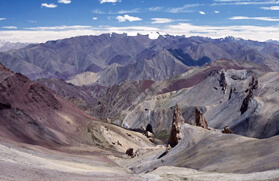 Leh is positioned at a distance of 70 kilometers from Alchi. Likir monastery is the famous destination on the route. Check in the hotel on arrival. Enjoy the overnight stay at hotel. Revitalize and comfort your senses. You may enjoy the half-day tour to city. This tour can be organized if you request for it in prior. This tour will incorporate a 17th century palace, Shankar Monastery, Namgyal Tsemo Gompa, etc. visit the local market at evening. You may purchase some souvenirs for your family and friends. Savor the delicious Tibetan cuisine and have overnight stay at hotel. Take your breakfast and get ready. You will be escorted to the airport by the travel assistant.